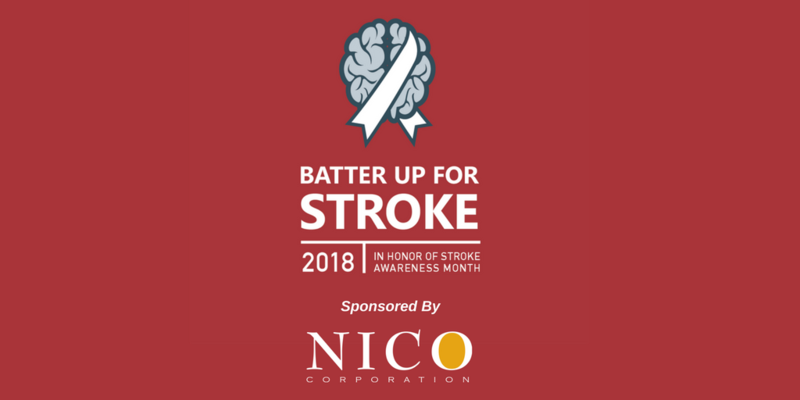 Join The Joe Niekro Foundation as we Batter Up for National Stroke Awareness Month in May! A special thank you to our sponsor, NICO Corporation, for helping us spread critical awareness towards hemorrhagic strokes. This form of stroke is either a ruptured brain aneurysm or a weakened blood vessel leak that suddenly interferes with the brain’s function. Blood spills into or around the brain and creates swelling and presume, damaging cells and brain tissue. Intracerebral Hemorrhage: This kind of stroke is when bleeding occurs from a broken blood vessel within the brain. Subarachnoid Hemorrhage: This kind of stroke takes place during a hemorrhage, the subarachnoid space fills with cerebrospinal fluid causing that space to become bloody. Many people are unaware that 40% of ALL stroke deaths are due to hemorrhagic stroke. Our foundation is continuously working to expand our National Patient Support Group Program (we’re now at 43 support groups!) as well as providing education and awareness towards this devastating condition. We feel that it is extremely important to help people affected by hemorrhagic stroke understand what it is that they are dealing with, physically and emotionally, whether that be a survivor of a stroke or a loved one, not just at the time of initial diagnosis but long into post recovery. Take part in honoring stroke survivors and paying tribute to those who have lost their battle by making a Donation (below) during the month of May! Your donation is essential to supporting our mission and we thank you for joining us in the fight. One person can make a difference. You can make a difference – it happens every day. Thank you for joining in the fight of brain aneurysms, AVMs and hemorrhagic strokes.